Valentines Day is on Tuesday and if your 'special someone is into seafood and not steak I have an easy dinner that you can prepare for her in no more than 30 minutes. 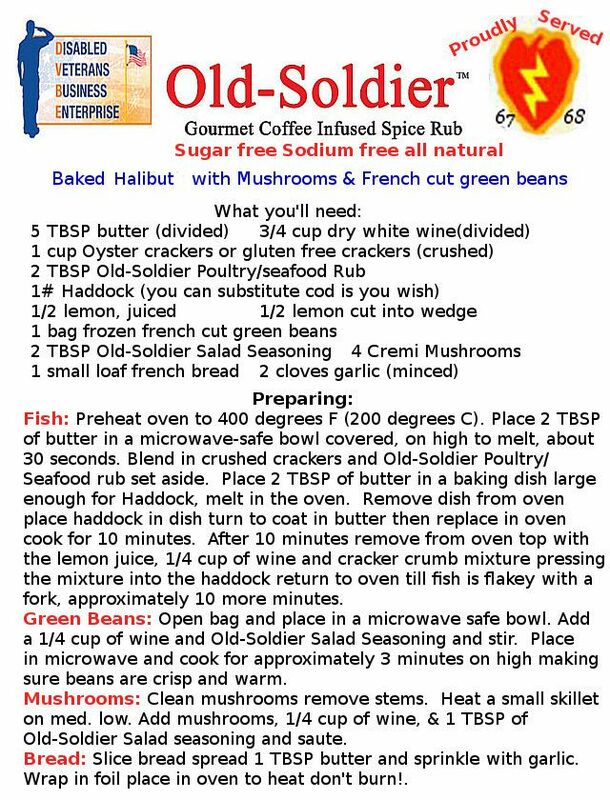 For this recipe I used Halibut from, 'Southern Alaska Seafood', southernalaskaseafoods@gmail.com but I've also used their Cod and locally purchased Haddock for the recipe. By far I found the Halibut to be exceptional. As sides for this meal I served French Cut Green beans, sauteed mushrooms, and sourdough baguette. I served a bottle of Sauvignon Blanc with the meal and for dessert I brewed a pot of Warriors-brew Love Puppy blend gourmet coffee with a shot of Coffee Lolitta Mexican Liqueur topped with a dollop of whipped creme. I'm sure that someone special will enjoy the meal and the effort you put into it and remember, 'Enjoy life, this is not a dress rehearsal! Great Valentine meal or any romantic evening.